In January 1814 "An act to fix and regulate the quality of silver plate, manufactured and sold, or offered for sale, in the city of Baltimore, and for other purposes" was passed by the Maryland state legislature and signed by the governor; this established the only government sponsored consumer protection for silverware that existed in this country that was similar to European practices. Beginning in August 1814 all silverware made or sold in Baltimore was required to be tested and marked to indicate that it met the quality standard of 11 troy ounces silver to every ounce of alloy (11/12 = 91.66%). The first assayer was Thomas Warner; it is presumed that he was responsible for the advertisement that announced that "The mark adopted is the shield of the Arms of the State, shape of an oblong square with the corners taken off, and the dominical letter of the year". Sometime in 1815 a third mark of a man's bust facing right in a cut corner rectangle was added; these three marks continued in use through the end of 1823. Due to the short dominical letter cycle there was a repetition of a set of marks when those of 1823 duplicated 1817; distinguishing between these two dates is usually possible by consulting the assay officer's reports as only three firms are listed in both reports. Although in February 1823 first William Thompson and subsequently John S. Warner were selected as the replacement assayer, the 1823 Assay Officer's Report was signed by Thomas Warner rather than his younger brother John; Thomas is generally regarded as the the assayer for the entire period 1814 to 1823. With the appointment of LeRoy Atkinson as assay officer in 1824 a change in the appearance of the assay marks occurred. The new marks were an oval arms of the state within a cut cornered oblong square and a "C" date letter in a similar outline; the use of the "bust" mark was discontinued. 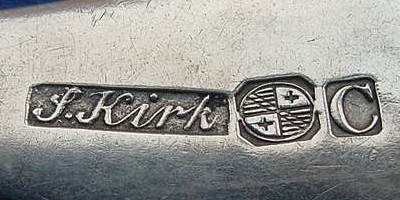 It has long been noted that there are no other date letters that appear with this particular state arms mark; it is probable that the same two marks were used until the end of Atkinson's tenure in 1829. Dennis McHenry was first selected as his replacement but eventually Samuel Steele was appointed as the new assay officer. The silversmiths and jewelers of Baltimore had been unpleasantly surprised by the adoption of the assay law and despite efforts in 1814 and 1817 for its repeal or alteration it was not until February 1830 that it was modified; after that date silver could be struck with a numerical quality mark by the manufacturer to indicate the standard rather than having it tested by the Assay Officer. For a long time it had been assumed that with the silversmith given a chance to mark the silver with the quality themselves and save the cost of assaying at five cents per troy ounce there would have been virtually no silver sent to the assay officer; however the discovery of surviving assay officer's reports from the 1830's and early 1840's established that a large amount of silver continued to be assayed by Samuel Steele. Assay marks that had previously been assigned to the latter years of Atkinson's tenure are now believed to have been used by Steele. Three different sets of marks (and variations) have been identified and assigned into a chronological order from 1830 to 1843 although more precise dating of them has not been possible. The first set consists of a small "state arms" of cut cornered oblong form and a "tower"; these have been seen on silver with engraved dates of 1831 and 1832. The second set are a re-use of the marks of Atkinson; the large oval "state arms" and "C" can be distinguished from the earlier examples by the removal of the cut corner outline of the marks so they now appear to be in ovals. 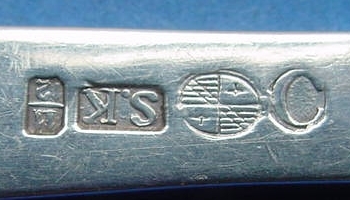 These latter marks often occur with a numerical quality mark that was presumably not used on silverware produced before 1830; it has not been noted on the assay marks used by Atkinson or the earlier set of Steele's marks. A presumably later variation of this second set of marks are in mirror image; this resulted in reversed oval "state arms" and incuse "C" marks. 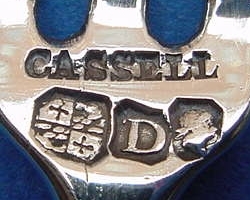 The third set marks features a smaller oval "state arms" and incuse "F" mark; they commonly occur with the numerical quality mark. 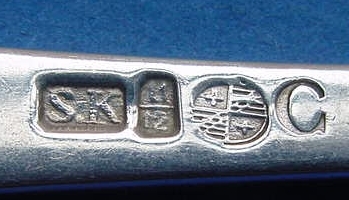 These assay marks were originally believed to date from 1828 (for which the dominical letters were "FE"); if the "F" is a dominical letter it would likely be 1833 rather than 1839 due to the quantity and variety of silver surviving with these marks. 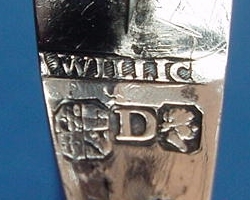 The earliest variation of the oval "state arms" shows the bend dexter (diagonal lines crossing the arms) similar to all the previous "state arms" assay marks; this was followed by the oval "state arms" without a bend dexter. 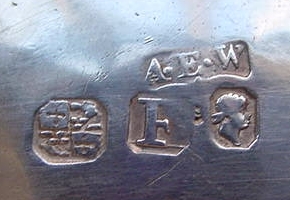 The final variation of the oval "state arms" mark is more roughly cut; it appears on some silverware marked by R. & A. Campbell who only appear in the Assay Officer's Reports for 1842 and 1843. Although there continued to be a Baltimore City Assay Officer until at least 1853 (Joseph P. Warner in 1844 and 1851-1852, Samuel Steele again in 1845-1850, and Thomas Hynes in 1853); there is no surviving evidence that silver continued to be assayed and marked after 1843. A longer article on the Baltimore Assay Marks (and later marks) may be found in Silver in Maryland (The Maryland Historical Society 1983) on pages 26-37i; this includes transcripts of the surviving Assay Officer Reports and other documentation. © Patrick M. Duggan.